Twofer Tasty . . . Tasty Thursday doubles up! Because I got a tad behind, so you get 2 in one. Remember that these go up on YouTube every Thursday morning, or on Patreon with a story if you like that part of it. We love pizza, which may or may not be a surprise to you. I've done so many different pizza videos on Tasty Thursday I'm working on an e-book, complete with videos (can you do that?) to gather all the relevant recipes and techniques in one place. We have our favorite versions: Jeremy loves a good margarita pizza, with fresh mozzarella and basil and roasted tomatoes. Julian is more of a traditional, plain cheese guy - although lately he's been obsessed with anything bacon. BBQ chicken with bacon? Bring it on. Bee gravitates to the Hawaiian, with the pineapple sweetness appealing to her sweet nature. And me? Anything with feta cheese, thanks. Spinach and feta. Shrimp with tomatoes and feta. Roasted veggies with feta. You get the idea. This one has snuck up on us. We went out to dinner one night to Fry Spring Station, a local garage-turned-restaurant (there are a couple of these around!). The food is reliably good, the beer list reliably decent, and it's not so loud in there you can't hold a conversation. We rarely go out to eat, and we've been burned enough times by crappy restaurants that we're wary of new spots. The one exception to this rule is at Restaurant Week time. Twice a year in Charlottesville, local restaurants get together and offer prix-fixe menus at different price points. A set amount of each goes to the local food bank. It's a time to try some place new and feel good about eating out. There have been a couple of duds. There was the super expensive place that started us out with a paper-napkin lined plastic basket with a handful of stale popcorn as the "amuse bouche" (we were not amused; we won't return). There was the spot that was out of the entree options on the prix-fixe menu and wanted to charge us the regular menu price for sub-par substitutes. The last time we were there, we decided to try The Dude Abides pizza. 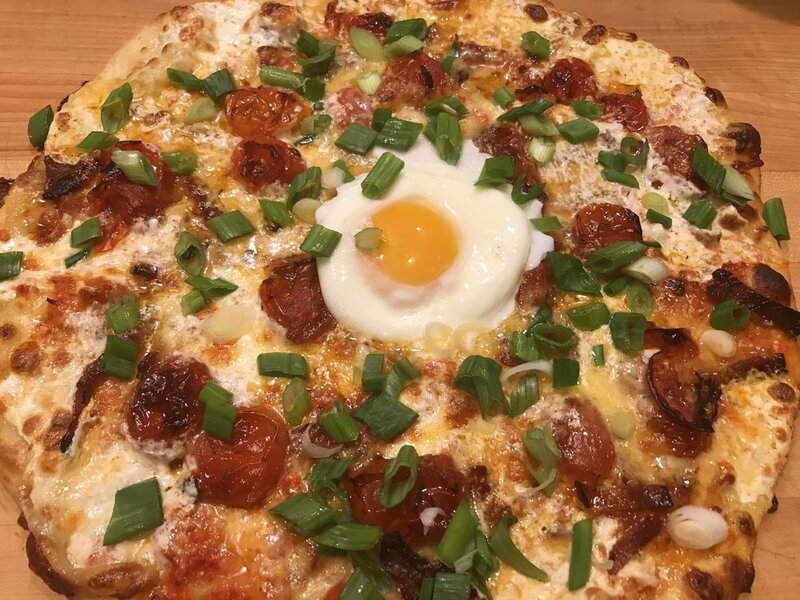 Poached egg on pizza? Bizarre. Yes, that's a poached egg. Also excellent with jalapeño peppers or banana peppers. And a sprinkling of fresh basil or even cilantro. This is a light-hearted version of a cooking show I've heard about frequently; we don't have cable so I've never seen it. Scene: Outer Banks rental house, Christmas time. We're the first to arrive, with time to stock the house, make beds, chill the wine, and settle in. The beach is over the dune, the hot tub is hot, and we're ready to play. Each contestant had $10 to purchase ingredients at the store (this is a way to make grocery shopping more fun and a group event, just in case you were wondering). The assignment? Appetizers. Specifically, nothing that was a main course or a dessert. The contestants had the length of a workout (30 minutes) to get their creations made, plated, and presented. Who won? You be the judge! Newer PostCooking competition. Chocolate covered strawberries - and MORE!